In previous posts I’ve talked about the differences between investing in TD e-Series funds through a TD Mutual Fund account and a TD Direct Investment account. Both are good options, and many start with the simpler path of investing through a TD Mutual Fund account. Eventually, this may not meet your needs anymore, and you’ll need to move from investing through TD Mutual Funds to TD Direct Investment. To make sure we are all on the same page, let’s quickly go over the 2 ways you can invest in TD e-Series funds. The TD Mutual Fund account allows you to buy TD e-Series funds your regular online banking portal (TD EasyWeb). But first, you will need to setup a mutual fund account that has been converted to an e-Series account for this option to be available online. Using a TD Mutual Fund account is typically the cheapest and simplest way to invest in TD e-Series Index Funds. Fees: There are no fee’s for buying and selling TD e-Series funds through this account, nor are there any fees for the account itself. You can make as many mutual fund trades as you like for no commission, which makes this a good option for those who want to contribute monthly to their portfolio. You can also purchase e-Series funds through a TD Direct Investing account. 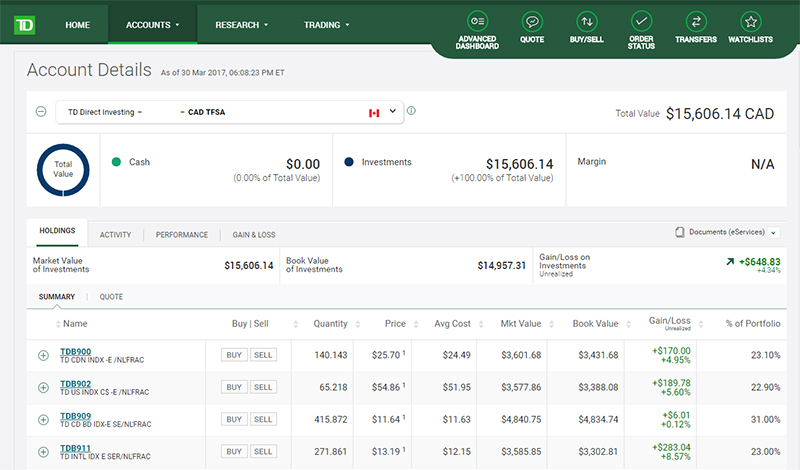 It is TD’s online investment brokerage that you can use to trade in markets across North America, and buy stocks, options, ETF’s and mutual funds, including the TD e-Series Index Funds. TD Direct Investing is a more robust system that provides more information, and allows you to do more than purchase and sell mutual funds. Fees: There are no trade commission fees when buying TD e-Series index funds through TD Direct Investing. However, there is a quarterly maintenance fee of $25 ($100 per year). You can have these fees waived by investing more than $15,000 or by setting up an automatic monthly investment deposit of at least $100. That changed through when I switched my day-today banking needs from TD to Tangerine. While you can setup an authorized pre-payment plan to make contributions to your TD Mutual Fund account from a bank account outside of TD, there isn’t an easy way to make contributions on your own schedule or of varying amounts. They have to be the same amount every time and at the same time of the month. Since I like to make additional contributions whenever I have some extra money lying around, this wasn’t going to work for me. I still liked the TD e-Series funds as a better investment option than the ones that Tangerine offered, and I didn’t want to switch. The answer – a TD Direct Investment Account. You are able to contribute to your TFSA and RRSP in your TD Direct Investment account by making a bill payment from another institution. This means that whenever I want to add money to my investments, I just make a bill payment to my TD Waterhouse payee, and a few days later, the money shows up and I can buy additional shares. Easy and flexible. So I switched my investment method from TD Mutual Fund accounts to TD Direct Investment accounts to stay invested in my TD e-Series funds. To make the switch, you’ll need to physically go to the bank. You never know how busy the bank will be. I suggest calling ahead and making an appointment instead of just dropping by. Mention that you want to open a TD Direct Investment account. Bring a cheque from the bank you want to withdraw investment funds to. While you really shouldn’t be thinking of cashing in investments, it’s good to know that you can. The rep will be able to use this as your default withdrawal account – when you cash in funds from your TD Direct Investment account, this is where it will go. Yes, it can be a different bank than TD. Tell the TD Direct Investment rep that you want to open up a TFSA and/or RRSP account with TD Direct Investing and that you want to transfer the funds from your current TD Mutual Fund accounts to the new TD Direct Investment Account. Tell them you want the funds to transfer directly, you want the same funds you currently have, but in your new TD Direct Investment account. The rep may have questions about your investment decisions or try to sway you to a different investment – don’t let yourself be bullied! You can answer honestly: you like the low fee’s and the personal management of the TD e-Series funds. They shouldn’t push too hard. You’ll have to sign the papers they provide you, these will be the papers that they mail off to open your new TD Direct Investment account. I know it’s hard, but I suggest at least skimming them, if not fully reading them. As with other things to do with TD e-Series, it takes a week or 2 for your new TD Direct Investment accounts to open. You should receive an email when the new account it open and ready. Your money WILL NOT have been transferred yet, so don’t fret if you see 0’s! Once the TD Direct Investment accounts have been opened, you’ll have to go back to TD in person to sign the paper work to authorize the switch in funds from your TD Mutual Fund account to your TD DI account. Your TD rep will send this in by mail, which will take another week or 2 for your funds to actually transfer. NOTE: Your current investments will remain invested until the switch happens, you won’t lose any investment income during this process. Once this transfer goes through, you should again receive an email from TD confirming your purchases in your new TD Direct Investment account. NOTE: I switched both my TFSA and RRSP at the same time, but the fund transfers went through on different schedules. Don’t fret if one transfers before the other ones does if you do both. You should now have your TD e-Series investments up and running in your TD DI account. You can now take advantage of the beefed up interface, add to your investments through bill payments, and have a wider array of investment options available to you. Thank you for your post. I’m currently looking into doing this with our RESP’s. Were there any fees for transferring out your TD mutual funds? I know there are fees when you transfer between institutions but does this count as that kind of a switch? There are no fees when transferring from TD Mutual Funds to TD Direct Investment, although there is some paperwork that needs to be done through the bank. Much like if you were going to re-balance your portfolio by using the “switch” option, you should be able to “switch” between whatever funds you have now, and move them into e-Series funds, without having to sell them. This should keep everything neat and tidy, and keep all of your funds within your respective TFSA and RRSP accounts. Thanks so much for posting this. I’m near the 15k mark on my TSFA and have been looking to switch. This post makes the whole process much less daunting. I already have a TD Direct Investing Account -CAD Cash. Also, I had mutual fund RRSP and TFSA both in TD Comfort balanced Portfolio. I decided to start investing in the E-Series Funds. I got the TD person to transfer my RRSP/TFSA mutual funds to my Direct Investing A/C. Now I have Cad Cash in TDB8150 (saving with 1.1%), SDRSP in cash ( the bank person made the fund ready for e-fund) and CAD TFSA in the same fund as before- TD Com Bal Incm (for future transfer). Now I want to invest in E-series fund. Please advise how to invest in e-fund from my a/c. I think that from my TFSA and CAD cash I can make the transfer. My SDRSP is already in cash and should I simply buy the E-Series Fund? Another question. When the bank person transferred my RRSP from the mutual fund in TD Direct Investing Account SDRSP in cash do you think it will be some tax penalty? In your TFSA, you can use the “Switch” option to switch from the TD Comfort Balanced Portfolio, into different TD e-Series funds. When you click on your TFSA and can see the different funds that you have, you can click the ‘sell’ button. Once you do that, a new window pops up, and provides you with an ‘Action’ option which will currently be on ‘Sell’. Change that to ‘Switch’, which will then allow you to define which fund you want to switch your funds into. As for your second question, if the bank representative transferred the funds from your previous RRSP account, into your new SDRSP account, then there should be no tax implications, as you didn’t sell or withdraw any funds from an RRSP account, you just moved them. Hope that all helps. Let me know if you’ve got any follow up questions. Thanks a lot!!! It is very helpful! Now I understand how this works, Regards. There seems to be a lot of information about transferring RRSP and TFSA, but what about Non-Registered Accounts? I currently have a cash account through TD Managed Funds and a separate Cash account with TD Direct Investing. I want to know how/if, I can transfer that Managed “Cash” Account to Direct Investing? It’s hard for me to speak to this, as I’ve never gone through the process of transferring managed funds to a TD Direct Investing account. Do you hold the managed funds in a regular TD Mutual Fund account? As my experience mostly revolves around registered TFSA and RRSP accounts, I wouldn’t feel comfortable commenting on how to move between non-registered accounts, as I don’t know the full tax implications of moving investments. I would recommend talking to a TD representative to ask how to move from your Managed Funds to your TD Direct Investing account, and the associated taxation that might come with that. Once you have the money in your Cash account in TD Direct Investing, it should be the same process to buy the different TD e-Series funds, just using a non-registered account instead of a RRSP or TFSA. Sorry I can’t be more help on this topic. How do I contribute monthly to my TFSA and/or SDRSP accounts within Web broker from my TD Chequing account? Once its in, do I have to manually allocate the funds each time I deposit or is there a way to automatically allocate to each fund (i.e. lets say $100 each month and I want to follow the assertive TD e Series CCP portfolio, so $25 to each of the 4 index funds)? I don’t have any direct experience with automatic payments from a TD chequing account into TD Direct Investing to buy specific funds, so I won’t be able to give you a definitive answer. From what I’ve seen, the option is available to automatically transfer money from TD chequing to a TD Direct Investing account, but from there, you would have to manually purchase each of the funds in your portfolio. specifically the Pre-Authorized Deposit (PAD) Form / Monthly Contribution Plan (MCP) Form. No matter what, to set up an automatic transfer plan, you’ll have to fill out one of these forms and provide them to a TD Direct Investing rep – at that point you could check with them to see if it’s possible to setup an automatic asset buy right after the transfer. Sorry I can’t be more help, but feel free to post back if you find out more information about this. I have an unregistered e-series Mutual Fund account with >$15k invested. I don’t contribute monthly but haven’t had any issues doing so with lump sums from a non-TD checking account (e-interac to TD, move to Mutual Fund account, buy e-series funds). You seem to suggest above that this would be the main reason to prefer TD Direct Investing over Mutual Fund account, are there other reasons? I do want to move my RRSP and TFSA from another bank to TD – would I need TD Direct Investing to achieve this or can I still use Mutual Funds? I’m new to Canada so some of the terminology is confusing and I don’t want to miss something important between the two options. If using TD Mutual Fund accounts is working for you, then there aren’t any major advantages to using TD Direct Investing instead. I prefer the TD Direct Investing platform and user interface, but that is just purely preference. If you can get TD to do a registered transfer of funds from your current RRSP and TFSA holdings to your TD registered Mutual Fund accounts (you’ll probably need to fill out some paperwork to do so), then sticking with TD Mutual Funds should be just fine. Thank you. I have found my local TD branch advisor to be extremely helpful to date so I’m confident I get the paperwork done. Having figured out how to use easyweb I’m happy to stick with it if there’s no advantage to switching. Your input is appreciated!